The Los Gatos real estate market is “hot” overall – but not equally, and certainly not in all areas or price points! Yesterday I crunched the numbers from my MLS to provide for you the absorption reate or months of inventory. 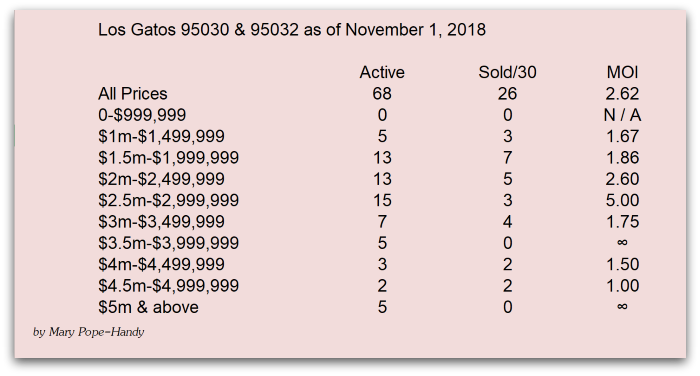 This figure is calculated by getting the count of active listings (not under contract – some statisticians include pending sales as well) and the sales closed in the last month and dividing them. If there are 3 homes for sale and 1 closed in the last month, you have 3 months of inventory. What this means is simple: if no new inventory came on the market, how long, at the current rate of sales, would it be for buyers to “absorb” the current supply of inventory? The shorter it is, the hotter the market. Five or six months is balanced. What’s hot? Up to the $1.5 million point, everything in LG is hot! The cooling starts at $1.5 mil in the part of down with Campbell or Union Schools. For houses “in the schools”, the market remains strong up to the $2 million mark, where it changes dramatically. How are things for the over $2,000,000 point? Over $2 million, it’s anywhere from a balanced market to impossible to sell for Los Gatos houses on the market. Homes over $2 million are tough to sell if they don’t feed to Los Gatos High School. But even properties which have LGHS as the school of attendance are challenged to sell in the upper pricing tiers. 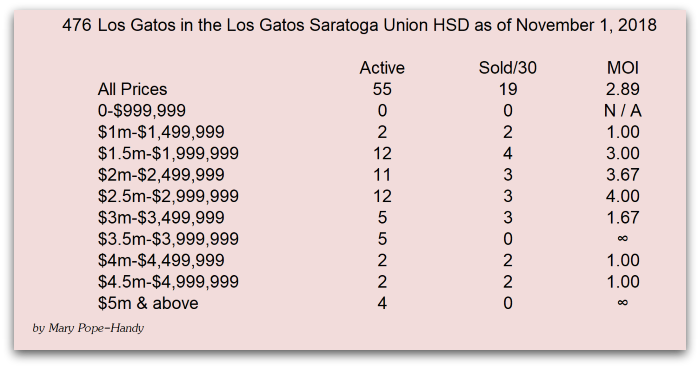 Below please find the statistics and numbers for house sales in the town of Los Gatos (95030 and 95032) which closed in the month of April. Things are looking up! Improvement month over month, but year over year the numbers are still down. Softer prices prevail in the mountains…. This is really weird to have the short sales be selling so much better than regular sales. In Sunnyvale it’s the complete opposite! There regular condos and townhomes are selling at the rate of 4.42 MOI but those which are short sales are a whopping 16 months! To get data and info on the rest of Santa Clara County, please visit my Silicon Valley real estate blog, The Valley of Hearts Delight. Monte Sereno is a small city of approximately 4,000 residents. Prices there are a little more expensive than Los Gatos, but the two areas are almost like family as they share police, schools, parks and more. Here’s a quick look at the real estate inventory (homes for sale) in Monte Sereno and the absorption rate. 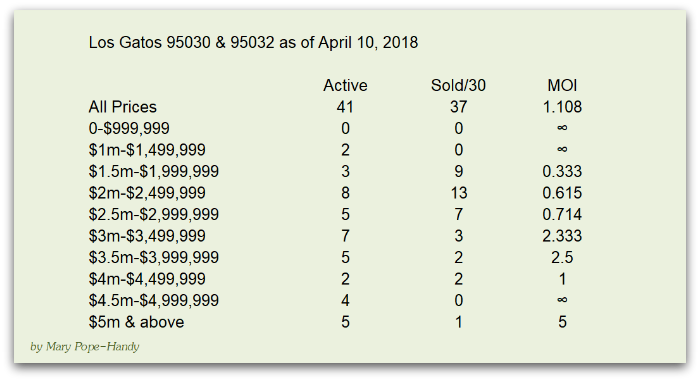 There were NO short sales or bank owned homes either for sale or recently closed, so all of the numbers below reflect “regular” sales. All together, the “months of inventory” for Monte Sereno is 9.25. That’s a very high number for the absorption rate and it indicates that it’s a strong buyer’s market in Monte Sereno. Monte Sereno, like everywhere else in Santa Clara County, varies from one location & price point to the next. The most affordable homes are in a very different market than the most lavish luxury homes. So let’s see how it plays out if we break it down by price point. Llike the rest of Silicon Valley, Monte Sereno has its hottest segment of the realty market at its “entry level” price range. For this city, that means homes priced between $1 million and $1.5 million. The market cools as prices rise, until nothing seems to be closing at all and the months of inventory are “infinite”. Looking at the pending sales, though, homes are selling in higher prices. At the moment there are six houses which are under contract in Monte Sereno. The list prices range from $1.1 million to $3.688 million. The average list price of these properties is about $2.1 million. 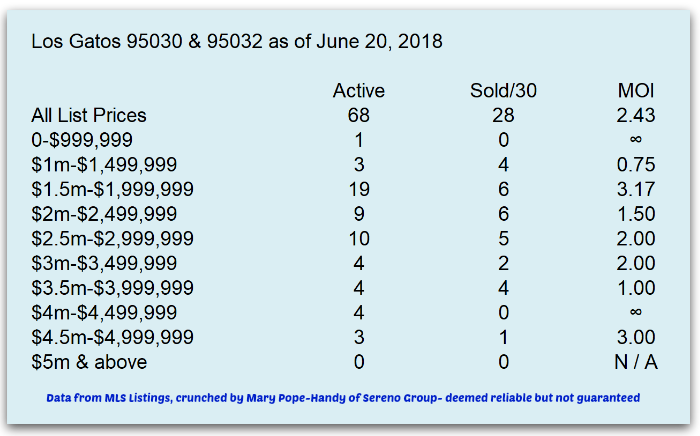 While the recent sales don’t show much activity over $2,000,000, there are two pendings between $3 mil and $4 mil in Monte Sereno, so the absorption rate will be changing as these higher priced homes close escrow. And we see again that the majority of pendings are on the lower end of the Monte Sereno scale (expensive in any area but relatively affordable here). What seems most consistent is this: the homes most likely to sell in Monte Sereno are those priced in the most affordable ranges. More expensive homes are selling, but the “constant” is the desireabiity of the entry level market there. Tired of hearing the doom and gloom regarding the real esate market? Most of that negative press is national news, not local news. Truly, it doesn’t impact home values in Los Gatos if prices are falling in parts of Florida, Vegas, or even in Sacramento. 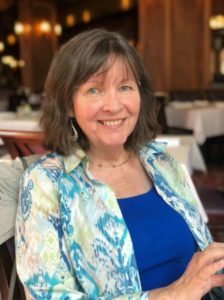 The local market – our town plus neighboring communities here in Silicon Valley – is the crucial one. 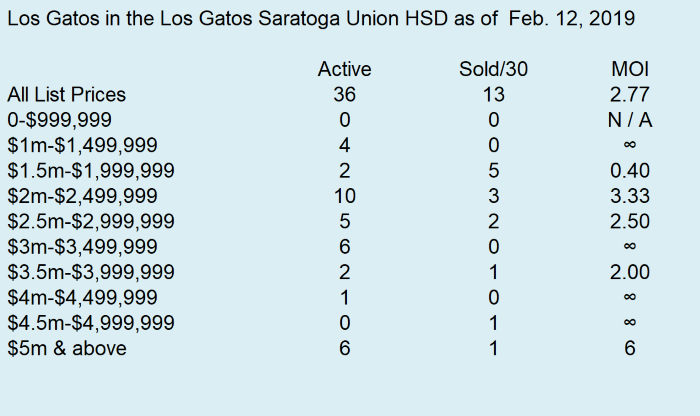 Things are just not that bad for home sales in Los Gatos overall. That said, “the market” consists of several sub-markets. It’s one thing if you are trying to sell a very expensive home with an unpopular architectural style. It’s another if you’re marketing a modest or at least non-extravagent home in a good location with great schools. Still another if you have a view property…or a lot that could be split. And no matter what, overpriced just won’t work. For the condo and townhome market, it was even stronger. Once again, it was a little more challenging late in the year (not an unusual pattern for any year). What about now? How is the inventory of homes in Los Gatos right now? About one house in four is selling in this area overall. That’s pretty much the case in Los Gatos, Saratoga, and Cambrian Park. 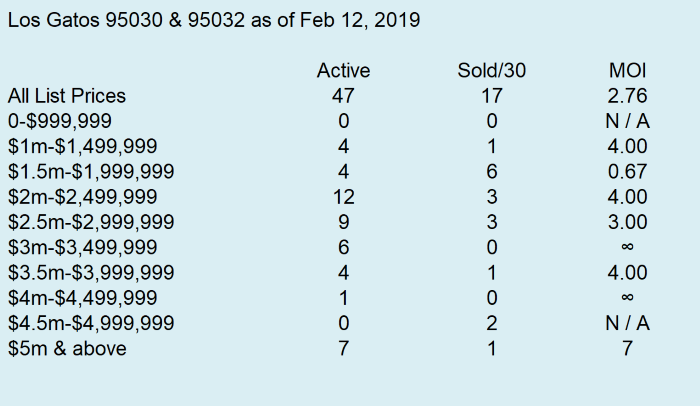 In Los Gatos there are 97 single family homes available and 27 sale pending (in Saratoga it’s 61 and 17, and in Cambrian Park it’s 140 and 34). The condo market, which was much stronger throughout 2007 than the single family market, is now cooler than the single family home market in town. As of today, January 21st, there are 26 townhouses or condominiums for sale and just 2 under contract or sale pending. (So instead of a 1 in 4 chance of selling, it’s closer to 1 in 10.) In Saratoga it’s a little better with 10 available and 3 pending. In Cambrian there are 41 “class 2” (condo/townhome) on the market and 7 which are pending sales. Every market presents an opportunity for buyers or sellers. Where’s the best real estate opportunity in Los Gatos now? Late in 2007, it appeared to be an ideal time to be a “move up buyer” – to sell that townhouse and to buy a single family home. Now, early in 2008, the opportunity has shifted. It is now a great time to sell that single family home and to downsize into a townhouse or condominium. The market is always changing and the micro markets can all be different from the general trends in the town. If you’d like to discuss your home, your neighborhood, or buying and selling, please send me an email or give me a call. I’d be happy to set up a time to talk with you about your unique situation.